In the Roll Forming Industry, there a new unique rotating dies for punching, notching, partial punching, dimpling, embossing which is named Rotary Punch. 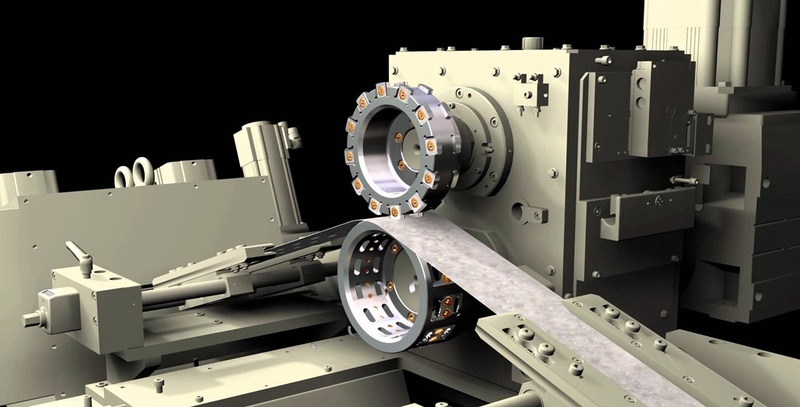 The rotary punch utilize the continuous movement of the coil strips driven by the roll forming mill. The rotary die contains 2 rollers, the top and the bottom rollers. The top rollers hold the punches, and the bottom rollers hold the dies. The rotary die is driven by the coil strips through friction. Uniform Pattern, very difficult to adjust. In rotary punching, the conventional up and down movement of the press ram is replaced by rotating tools and dies. One of the rolls, usually the upper one, contains the punches and the other one the dies. The two rolls are rotating with the same surface speed as the strip travels between them. The punch enters into the material at an angle punches it through, and then gradually retracts from the hole as the rolls rotate and the strip moves. The angle between the punch and the strip changes constantly during this process. male die reaching into a groove The gap between the male and the female die should be only 0.025 to 0.050 mm, and they should not touch each other. The gap is strictly for setup purposes; therefore, the shoulder alignment and shaft straightness are critical.